Edward James, London and West Dean. Galerie 1900-2000, Paris, by whom acquired from the above. R. Descharnes, Salvador Dalí, The Work, The Man, New York, 1984, p. 216 (illustrated p. 217). 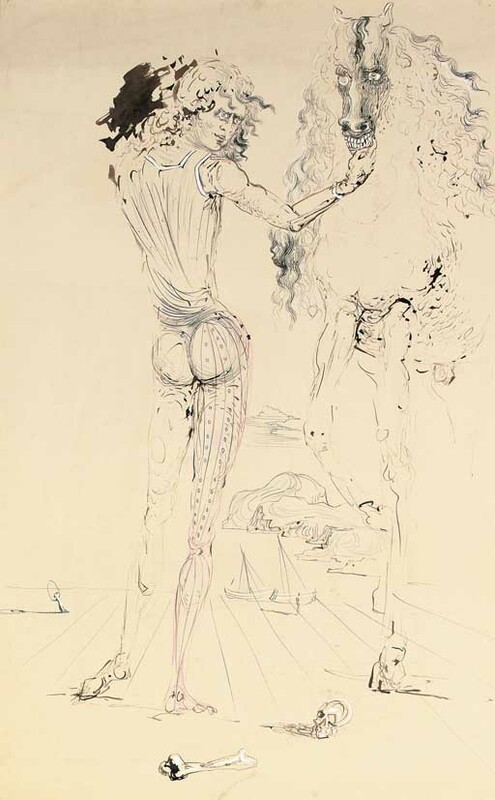 K. von Maur, Salvador Dalí, 1904-1989, Ostfildern, 1989 (illustrated p. 198). Worthing, Art Gallery, Paintings from the Edward James Collection, October - November 1963, no. 5; this exhibition later travelled to Eastbourne, Towner Art Gallery. Edinburgh, Scottish National Gallery of Modern Art, Edward James, Dalí, Magritte and other Surrealists, August - September 1976, no 29. Chichester, 901 Exhibition, 1976, no. 37. Paris, Musée national d'art moderne, Salvador Dalí, February - April 1980, no. 478 (illustrated p. 63). Rotterdam, Museum Boymans-Van Beuningen, Salvador Dalí, May - July 1980, no. 180. Paris, Galerie 1900-2000, Salvador Dalí, Douze dessins, années 1936-1938, September - October 1987, no. 5. New York, The Solomon R. Guggenheim Museum, Surrealism: Two Private Eyes, June - September 1999, no. 398 (illustrated vol. 2, p. 470).